Nice pictures Joe! You make a good photo subject. Even with the sand in your shoes. Are you guys out there today? We had a fun day at Dockweiler yesterday. USHPA members (Frank and Jim) flew while the school was open, and then Joe, Frank, and I flew under our waivers after the school was closed. The winds picked up in the late afternoon, and I was able to partially soar Frank's Condor 225. Same for Joe. I think we could have done some full back and forth soaring in a 330. Frank had a few nice flights and he's looking and feeling more at home in the air again with every visit. I hope to see some pictures. 1st day flying since my 83rd birthday. flying Windsports' Condor 330. That's got to be the best picture of the day!! You couldn't have a lighter grip than that. WIND: 8 to 12 mph est for bluff. Pleasant W and SW. Helpful. Bob Bendetson At 145 lb pilot body weight and low-weight school harness, he soared today several passes. Mark ____ Upon inquiry about hang gliding, he was referred by Chris Wills to Rob McKenzie for exploratory flight; now Mark is training at Dockweiler. Work: mtnriver.com River guide. Mark exchange river running stories with Mark; they both share considerable experience in white water rafting. Mom of one of the students ... fell on bike way. Jim Fenison told story of a female HG pilot that lost basebar at altitude but finished flight by staying holding the down tubes. Jim: has formed trails in forest. Jim described his very special carpentry skills. In the oven baking: Fenison-Faust low-pressure inflated wheels or roller for sand landing. Large diameter bearing. High Energy Sports, Inc. prototyping Fenison suprone harness. 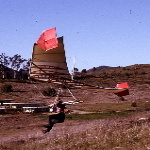 About High Energy Sports, Inc.
Jim had several flights in his borrowed North Wing EZY. He said he learned some things that will advance his project. 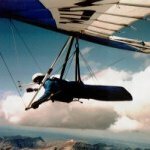 Jim shared stories of his flying habits and his experiences with his Fenison Fly Bar. New truck and HG racking! Special front license plate holder had two holes drilled to receive HG rack front-end support; nice job! First three flights of his "83" era! Good flights, two with stand-up landings on the Condor 330 in WS-open time. His third flight was on his own Condor 225 when WS was closed. I took a full flight in the North Wing EZY 170 belonging to Daryl Hamlin (Spelling?) Thanks to Jim Fenison, caretaker of the wing. Jim said it was 175, so I am confused, but link to info on EZY 170. Other flights in Frank's Condor 225: ten flights. Joe was Sherpa (returning the wing to launch) for one of Frank's flights and two of Jim's flights. A touring photographer will be sending a photo of JoeF to be posted when it arrives. He took about 10 flights on Frank's Condor 225. Bob was doing right to a knee challenge stemming from an injury exacerbated by a recent tennis-court motion. A private conversation was held with Bob Bendetson. Shelly and his very friendly dog Penny showed! We missed having the graceful presence of Joe Greblo, Andy Beem, and Josh Laufer for meeting Jim Fenison and his experimental harness. A short discussion was held by some of us about the importance of standing up for justice when a HG org injures a good pilot's reputation. 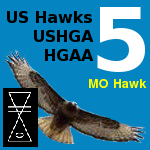 https://en.wikipedia.org/wiki/Cowardice Every member of u$hPa is invited to withdraw their membership so long as that org maintains the unfair injury they have served some good pilots. Frank, BobK, JoeF, and Jim F. had dinner in El Segundo at Beach Mex. Good time. Your report sounds like a wonderful bunch of events happened at Dockweiler Beach! If I could snap my fingers and have been there, I wouldn't have hesitated to do so. I have a similar non-beach site near me and I've got plans to try and soar it for at least a few minutes. It needs a nice constant 15 mph breeze from the SW. Those kinds of winds will be coming soon to my area. I've also now got a very nice 4K action cam so maybe I'll be able to capture some video, if and/or when. wingspan33 wrote: I have a similar non-beach site near me and I've got plans to try and soar it for at least a few minutes. It needs a nice constant 15 mph breeze from the SW. Those kinds of winds will be coming soon to my area. Humans have a long history of allowing unfair injury as long as it's not their ox being gored. It's rare (but much appreciated) when people stand up for others. I salute you Joe and all others throughout history who have been willing to stand up for the rights of others.